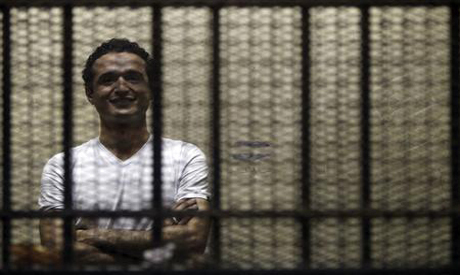 Prominent Egyptian activist Ahmed Douma was transferred back to prison on Friday after a brief hospital visit to conduct medical tests, despite pleas by his relatives that he remain in hospital receiving medical care. The 26-year-old activist, who is a co-founder of the April 6 Youth Movement, is serving a three year sentence for breaking a law that bans spontaneous public protests. Douma was on hunger strike, along with a number of other activists and prisoners, for more than a month, but ended his strike on Wednesday because of his deteriorating health. Mahmoud Belal, a member of Ahmed Douma's defence team, told Al-Ahram Arabic that the prominent activist was transferred from Tora prison to Kasr Al-Aini hospital in Cairo for medical tests before he was transferred back to the prison, despite his poor health. Douma's wife Nourhan Hafzy said her husband was transferred to hospital early on Friday to Kasr El-Aini hospital and then returned to prison. Belal condemned the decision to return his client to prison, saying the decision to send him to hospital was a "media show" to deflect public anger about the activist’s condition. "Ahmed left the hospital after doing some tests including MRI scans. The results of those tests are with the prison doctor. We did not take them or find out anything about the results,” said Hafzy. "The doctors said in a medical report at Kasr Al-Aini hospital that Ahmed Douma needs to be transferred to the ICU immediately, but security forces claimed that the hospital was not secure enough and that Ahmed would be transferred to the ICU at the prison hospital," Hafzy added in a note published on Friday on her Facebook account. Hafzy also said that her husband had low potassium levels. Ahmed Douma's health deteriorated rapidly after joining a mass hunger strike campaign started more than a month ago by a group of prisoners currently imprisoned in related to protest law chargers. He is also on trial in a separate case for his alleged participation in clashes at the Egyptian cabinet in December 2011.